Kids are expensive! They grow out of their clothes every 90 seconds and once those baby shower 0-3 month outfits are gone, you are on your own! Here are some quick tips to lighten the impact on your wallet, while still dressing your tots in style. Have older children? Save their clothing for the next little one. I had a boy first, and a girl second. You better believe my darling princess wears jeans her brother wore and plenty of his old night clothes. In fact, her favorite night shirt has a monster truck on it! Do you have older siblings with children? Ask them to pass down the kids clothes! You and your friends can swap clothes between families. The best thing about hand me downs is that they are free! Remember if you are “borrowing” clothing from a friend or family member in hopes of eventually giving it back to take good care of it. Invest in good laundry detergent and spot remover. Salvation Army, The Goodwill and Value Village are all hot spots for great bargains. Find out when they put out their new stock and you might just be surprised at what kinds of steals you can find! 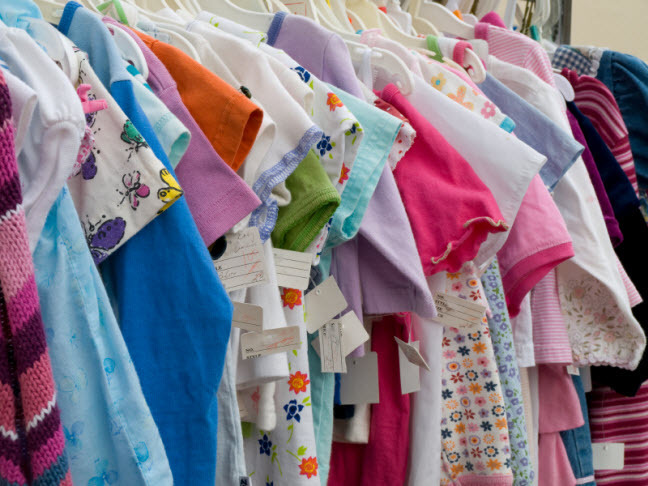 Think Baby Gap and Gymboree with the price tags still attached! Or check out the consignment shops in your area. Many consignment shops have a boutique-y feel nowadays and they are actually incredibly trendy. People who consign their clothing are often very picky about taking good care of everything. You can find some great bargains! I shop at consignment shops for my own kids every single season. I go to several in town and pick out some nice outfits, then I fill in the gaps in their wardrobes at discount stores like Target and Walmart. The Children’s Place, Baby Gap and Gymboree all send out coupons and discounts through email and through snail mail. Because these stores are a bit pricier, you want to make a beeline for the sales racks. Stack a sale with a coupon and walk out with your head held high with nary a dent to your checkbook. Make it a habit to check their clearance racks for the next size up (or even the next 2 sizes up) whenever you stop by. Resolve to never pay full price for your children’s clothing! There’s no need to spend $40 on a sweater that they’ll wear for a month and a half. Even if you have several children, you still won’t get enough wears out of it to be worthwhile! You can dress your kids to the nines on less, you just have to get creative.